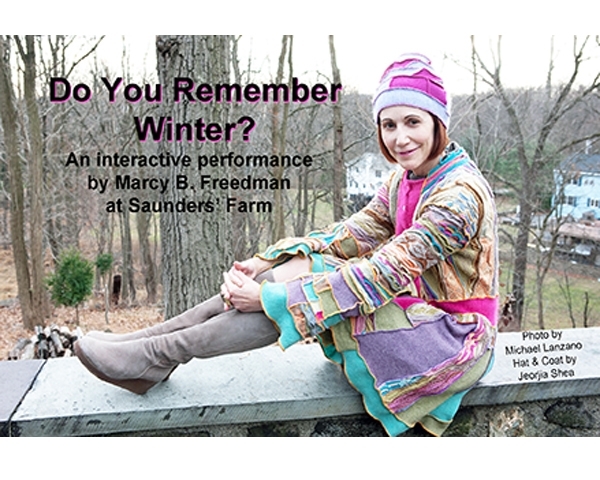 Every year, since 2009, I have presented a performance art piece at the annual art event hosted by Collaborative Concepts at Saunders’ Farm in Garrison, NY. 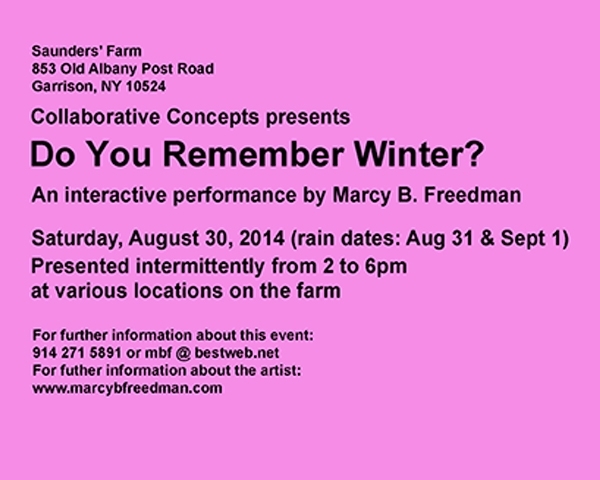 My 2014 project was an interactive piece designed to explore the realm of memory. Dressed in warm winter clothes on a very hot summer day, I wandered around the site, seeking out visitors willing to chat with me about the winter of 2013-14, which had been a particularly harsh season in our area, with lots and lots of snow and many days and nights of freezing temperatures. I had assumed that these extreme weather conditions would have made the season unforgettable! Instead, when I asked people if they remembered our most recent winter, I discovered a whole range of responses, from folks who had no special memories to those who immediately started to rant and rave about the horrors they had experienced. Furthermore, to my great surprise, I also encountered a few hardy souls who loved the challenges and the beauty of piles and piles of snow. Ultimately, the specifics of each conversation were irrelevant, because my goal was simply to have a one-on-one conversation with as many people as possible during my 4-hour performance. You see, this performance is part of my on-going attempt to provide the world with an antidote to the ubiquitous forms of “virtual” interaction, such as email, texting and social networking. 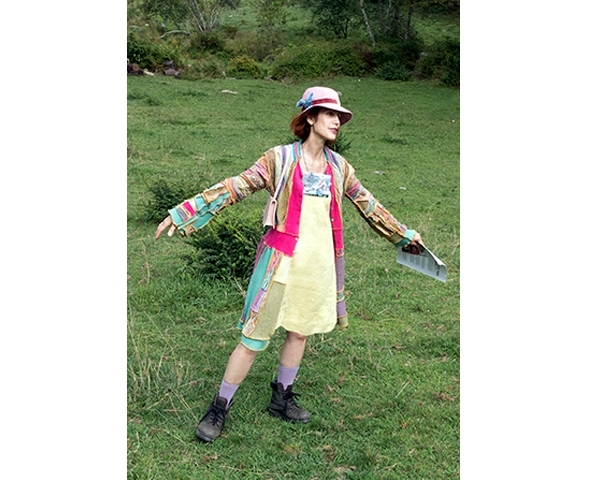 As such, my work is designed to engage real people in real time and real space for real interpersonal communication.